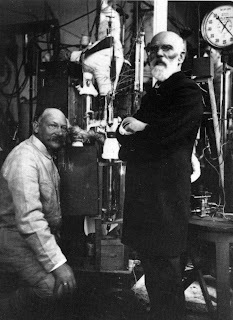 On July 10, 1908, a complicated apparatus working in the laboratory of Heike Kamerlingh Onnes in Leiden, Holland, managed to produce 60 ml of liquid helium, at a temperature of 4.2 Kelvin, or −269°C. Kamerlingh Onnes had been experimenting with cold gases since quite some time before, as he was trying to check the theories of his fellow countryman Johannes Diderik van der Waals on the equation of state of real gases. He had been scooped in the liquefaction of hydrogen (at 20.3 K) in 1898 by James Dewar (who, in the process, had invented the Dewar flask). But as it turned out, the liquefaction of helium required a multi-step strategy and a big laboratory, and this was Kamerlingh Onnes' business: Using first with liquid air, then liquid hydrogen, helium could finally be cooled enough, via the Joule-Thomson effect, to condense into the liquid state. The physics laboratory in Leiden had become the "coldest place on Earth", and immediately turned to the international centre for low-temperature physics. Three years later, in 1911, Onnes found that mercury lost its electrical resistivity when cooled to the temperature of liquid helium - this was the discovery of superconductivity. In 1913, Kamerlingh Onnes was awarded the Nobel Prize in Physics, "for his investigations on the properties of matter at low temperatures which led, inter alia, to the production of liquid helium". I read about the story of the liquefaction of helium in the July issue of the PhysikJournal (the German "version" of Physics Today - PDF file available with free registration). Moreover, the Museum Boerhaave in Leiden shows a special exhibition to commemorate the event, "Jacht op het absolute nulpunt", but the website seems to be in Dutch only. However, the curator of the exhibition, Dirk van Delft, describes the story in a nice article in the March 2008 issue of Physics Today, "Little Cup of Helium, Big Science", where he makes the point that the Kamerlingh Onnes Laboratory in Leiden marked the beginning of "Big Science" in physics (PDF file available here and here). The biggest chunk of helium is used for technical applications, which include pressurizing and purging, welding cover gas, controlled atmospheres, or leak detection. The second-largest part is already usage in cryogenics, such as in the cooling of superconducting magnets for magnetic resonance imaging (MRI, formerly known as nuclear magnetic resonance, NMR) machines in medicine, and of superconducting cavities and magnets for high-energy particle accelerators. Only then follow applications that include lifting, as in balloons or blimps. The LHC, for example, needs 120 metric tons of liquid helium to cool down the accelerator to a mere 2.17 Kelvin, when helium becomes a superfluid and an ideal thermal conductor (90 tons are being used in the magnets and the rest in the pipes and refrigerator - see p. 33 of LHC the guide), and 40 more tons to cool down the magnets of the large detectors to 4.5 Kelvin, so that the coils are superconducting . But even this huge amount of helium is just about 5% of the annual US consumption of helium for cryogenics! Helium is the second-most abundant element in the Universe, but on Earth, it is rare: The atmosphere cannot hold back the light noble gas atoms - ionized helium is transported along magnetic field lines into the upper atmosphere, where it's thermal velocity exceeds the escape velocity of 11.2 km/s . Thus, the constant helium content of about 5 parts per million (ppm) in the atmosphere is maintained only because helium is constantly being produced anew in radioactive decay: for each uranium, thorium or radon nucleus undergoing alpha decay in the Earth's crust, a new helium atom has emerged. This helium gas accumulates in gas fields within Earth, often together with natural gas. That's where helium can be won. Annual Helium Production. Data from US Geological Survey; click to enlarge. US helium consumption and exports clearly exceed production, which is possible because the US helium stock is being consumed. World helium production is still raising at the moment, but easily exploitable reservoirs will become rare some time in the future, as they are already now in the US. 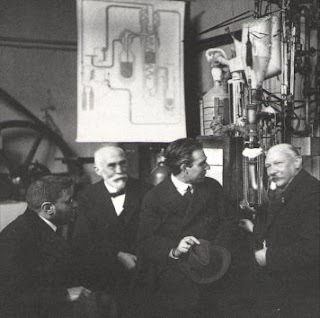 When Walther Meissner succeeded to produce liquid helium in Berlin in 1925 , he could not rely on helium supplied from american gas fields because of embargoes in the wake of World War 1 - helium to fill balloons and Zeppelins was considered of highly strategic value. Instead, he cooperated with a company who later sold commercially equipment to liquefy helium. And he could distill enough liquid helium to discover, together with his postdoc Robert Ochsenfeld, that superconductors expel magnetic fields – the Meissner-Ochsenfeld effect. Cooldown status - the current state of the cooldown of the LHC, from CERN. See for example page 250 and 251 of Noble Gas Chemistry by Minoru Ozima, Frank A. Podosek, Cambridge University Press, 2002. Verflüssigung des Heliums in der Physikalisch-Technischen Reichsanstalt, by Walther Meissner, Naturwissenschaften 13 No 32 (1925) 695-696. As a technician in a cryogenics lab were liquid helium is used daily, I can tell you that we have already begun to feel the squeeze with the helium shortage. Price hikes occur more than once a year and makes us extra careful about with our usage. I haven't checked, but is there any estimate when the US National helium reserve is expected to go dry? 10 years? Longer? For anyone interested I remember that NOVA did a great show on the history of low temperature physics a few months back. I recommend it to anyone interested in this stuff. This article is proof that one can’t judge a book by its cover or rather in this case a blog entry by its title; for in this case with the subject being helium one would suspect it would be a light read:-) (sorry I couldn’t resist the levity). More seriously this is a great post and interesting as this subject of helium relates to cryogenics and more generally low temperature physics with its questions about what happens as we approach absolute zero which couples to quantum mechanics and the uncertainty principle, Bose-Einstein's strange state of matter and so forth. Interestingly enough the last PI public lecture of the season was focused around the whole history of low temperature science and research, with Dr. William D. Phillips presenting. He is a researcher for NIST and a Nobel laureate resulting from his work in low temperature physics. I must report it was one of the best lectures I have ever attended anywhere, from both the enlightening and entertainment aspects, with one leaving with much to wonder about. It hasn’t been posted on their recordings list yet, which is unfortunate for I would have liked to point to it as to share. This post along with that lecture serves to remind me that with the LHC getting most of the limelight these days, we tend to forget there is other important experimental research ongoing that is breaking new ground and revealing some of the most fundamental and oft times strange aspects of nature. If we run out of helium, does that mean we can't do the Donald Duck voice by breathing-in a balloon? If so, then this really is a national crisis. Mine Jupiter's atmosphere or one of its moons? thanks for pointing out this comment by Phil Kornbluth, which provides a very interesting view on the issue! Maybe this "helium crisis" is more of an US phenomenon - in the US right now, helium production is decreasing (green curve in the second graph) and just equals demand (red curve), which has been increasing over the last years, but seems to have leveled off now. The point is that right now, the US National helium reserve is being used up (the grey curve in the second graph, which has been scaled down by a factor 1/5). If one extrapolates the current trend, the reserve seems to be used up by 2020 or so. So what do we do when we run out of Helium, what are the alternatives? OK, now that there seem to be left many more gas fields that can be exploited to produce helium, even one in Wyoming in the US, there is probably no real danger that we run out of helium. Moreover, "running out of helium" actually means that we would run out of low-entropy, easily exploitable helium from helium-enriched gas fields. But there will always be left the huge amount of atmospheric helium, which also can be "harvested", albeit at a higher cost. That's just what Meissner and the Linde group did in the 1920s in Germany, when they had no access to american helium wells for political reasons. Since "used" helium always escapes back into the fresh air, the atmospheric helium content won't be affected by harvesting helium from the atmosphere. Only problem is that this processing might be quite expensive. I don't in which technical processes helium could be replaced by other noble gases - but I guess in cryogenics, there is no replacement. A lot of research is yet to be done on helium. By the way thanks for sharing the article and useful helium data. 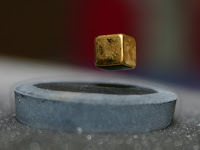 In the last image of this post, it is actually a magnet hovering above a superconductor, not a superconductor hovering above a magnet.